The NBA confirmed today that 2019’s trade deadline set and matched some records. The 14 trades completed on Thursday were the most made on a deadline day in the last 30 years, and the 19 teams involved in those swaps was tied for the most over that same period. In total, 34 players were involved in those 14 trades — and that doesn’t even count the eight deals completed during the week leading up to the deadline, as we detailed last night. Needless to say, there has been plenty of roster upheaval around the NBA, so we’re going to use this space to take a look at all 30 teams’ roster situations to see exactly where they stand. Does your favorite team have a full roster? Or is their roster somehow only two-thirds full? Looking at you, Raptors. The Hawks entered the week with 15 players, but had to waive Daniel Hamilton to clear a spot to acquire Jabari Bird. They subsequently traded Tyler Dorsey for Shelvin Mack, then waived both Bird and Mack. They currently have 13 players on their roster, leaving two open spots. They’ll have two weeks to get back to the league-mandated minimum of 14 players. After carrying 15 players all season, the Celtics traded Jabari Bird to create an open roster spot. They’ll explore the buyout market for candidates to fill that opening. The Nets entered the week with 14 players on standard contracts and one (Mitch Creek) on a 10-day deal. Creek’s contract was terminated a few days early to make room for Greg Monroe, who was waived after being acquired from Toronto. Brooklyn now has 14 players under contract and could opt to re-add Creek (albeit on a full-season contract), sign another player, or leave that spot empty for now. The Hornets had a quiet week and continue to carry 14 players, leaving one open roster spot. The Bulls created an open spot on their roster by trading Bobby Portis and Jabari Parker for Otto Porter, and are now carrying 14 players. The Cavaliers acquired two players – Nik Stauskas and Wade Baldwin – for Rodney Hood, which required them to terminate Kobi Simmons‘ 10-day contract early to stay at 15 players. Subsequently, Cleveland flipped Stauskas and Baldwin to Houston in exchange for Marquese Chriss and Brandon Knight, with Alec Burks heading to Sacramento in that three-team deal. The 3-for-2 move left the Cavs with 14 players and an open roster spot. The Mavericks, already at 15 players, acquired two veterans – Zach Randolph and Justin Jackson – in exchange for Harrison Barnes, and had to waive Salah Mejri to make the deal work. They’re currently at 15 players, but will be releasing Randolph very soon to create an open roster spot. The Nuggets didn’t make any moves this week and continue to carry a full 15-man roster. Both of the Pistons‘ trades this week were 1-for-1 swaps in terms of players, with Thon Maker and Sviatoslav Mykhailiuk replacing Reggie Bullock and Stanley Johnson. However, with the team closing in on a deal for Wayne Ellington, someone will need to be waived to stay at the 15-man limit. That player will reportedly be Henry Ellenson. The Warriors didn’t make any moves this week and still have 14 players under contract, leaving an opening for potential buyout targets. The Rockets had a very busy week. Initially carrying 14 players, they took on three (Iman Shumpert, Nik Stauskas, and Wade Baldwin) in exchange for two (Marquese Chriss and Brandon Knight) in a three-team trade with Sacramento and Cleveland. That put Houston at the 15-man limit, but the club subsequently sent Stauskas and Baldwin to Indiana, and Ennis to Philadelphia. Now the Rockets are carrying just 12 players and will have two weeks to get back up to 14. The Pacers had an open roster spot coming into the week, but in order to accommodate a trade that saw them acquire two players (Nik Stauskas and Wade Baldwin) from the Rockets without sending a player back, they had to cut Ike Anigbogu. Indiana reportedly plans to waive Stauskas and Baldwin, which would reduce their roster count to 13 players. They’d have two weeks to get back to 14. The Clippers, with a full 15-man roster already, made a pair of 2-for-1 trades on deadline day that required them to waive a player. For their deal with the Grizzlies, the Clips waived Marcin Gortat. They cut Milos Teodosic to accommodate their swap with the Lakers. The Clippers remain at 15 players, giving them a full roster, though there have been whispers that they’ll waive newly-acquired forward Michael Beasley. By sending Michael Beasley and Ivica Zubac to the Clippers for Mike Muscala, the Lakers opened up a spot on their roster. With 14 players under contract, the Lakers are expected to keep an eye on Markieff Morris, Carmelo Anthony, and other veteran free agents. The Grizzlies, who started the week with 14 players on standard contracts and Bruno Caboclo on a 10-day deal, were one of the league’s most active teams. Memphis started by trading JaMychal Green and Garrett Temple to the Clippers for Avery Bradley, reducing their roster count to 14 players. However, the deal sending Marc Gasol to Toronto was a 3-for-1 swap, forcing the club to waive a player — Omri Casspi was the odd man out, which bodes well for Caboclo’s chances of sticking around. The Grizzlies are now back to 14 players on standard contracts, plus Caboclo’s 10-day deal. The Heat already had an open roster spot and created a second one by moving Tyler Johnson and Wayne Ellington to Phoenix for Ryan Anderson. They’ll have to add a 14th man within the next two weeks. 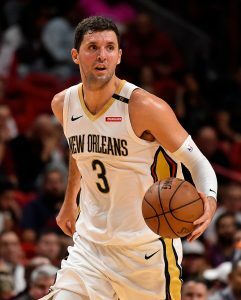 The Bucks didn’t give up any major assets to acquire Nikola Mirotic, and even opened up a roster spot in the transaction, sending out Jason Smith and Thon Maker in the three-team trade. Milwaukee is now carrying 14 players, leaving an opening for a possible buyout target. The Timberwolves didn’t make any moves this week and still have 15 players under contract. One of those 15 is Isaiah Canaan, whose 10-day contract is about to expire, so Minnesota could create a roster opening by letting him go. The Pelicans started the week at 15 players, then swapped Wesley Johnson for Markieff Morris. Their second move was a 2-for-1 deal, with Nikola Mirotic sent out for Stanley Johnson and Jason Smith. To make that deal official and remain at 15 players, New Orleans waived Morris. The Knicks, who had been carrying 14 players, didn’t make any trades this week, but still saw their roster count dip to 12 when they waived Enes Kanter and Wesley Matthews. New York will have two weeks to get back to 14 players, and has room to sign three players in total. The Thunder were quiet at the deadline, but made a trade last Friday, sending Timothe Luwawu-Cabarrot to Chicago. That deal reduced their roster count to 13 players, meaning they have one more week to return to 14. The Magic, who had a full roster, made one trade this week, which only involved two players — Jonathon Simmons for Markelle Fultz. As a result, Orlando remains at 15 players. The Sixers started the week with an open roster spot after Corey Brewer‘s 10-day contract expired. Their 3-for-3 deal for Tobias Harris didn’t change that, but their acquisition of Malachi Richardson from the Raptors gave them a full roster. Philadelphia followed up those moves by making two more deadline-day deals. Their Markelle Fultz/Jonathon Simmons swap didn’t require a corresponding move, but their acquisition of James Ennis did — in order to make room for Ennis, the 76ers waived Richardson. The Sixers are now at 15 players, but if they reach a deal with a free agent, they could potentially waive someone like Justin Patton or Furkan Korkmaz. The Suns entered the week with 14 players under contract. That number dipped to 13 when Emanuel Terry‘s 10-contract expired, which gave the team more than enough room to take on Tyler Johnson and Wayne Ellington for Ryan Anderson. Phoenix subsequently released Ellington, and is now at 13 players. The club will have two weeks to get back to 14. The Trail Blazers, who had been carrying 15 players, made a 2-for-1 deal earlier in the week for Rodney Hood and no longer have a full roster. They have 14 players under contract. After entering deadline day with a full roster, the Kings made three trades. Two were 1-for-1 deals (Skal Labissiere for Caleb Swanigan, and Iman Shumpert for Alec Burks), but the other one saw them acquire Harrison Barnes for Zach Randolph and Justin Jackson. That reduced their roster count to 14 players. The Kings’ roster count dropped one further when they Ben McLemore, but they signed Corey Brewer to a 10-day contract today. Sacramento is now back to 14 players, leaving one open roster spot. The Spurs had a quiet deadline and still have a full 15-man roster. As I alluded to in the introduction to this post, the Raptors had an eventful week that saw them shedding players left and right. Toronto, already with one open roster spot, traded three players – Jonas Valanciunas, C.J. Miles, and Delon Wright – for Marc Gasol, and moved Malachi Richardson and Greg Monroe in salary-dump deals without taking anyone back. In total, the club traded five players for one, reducing its roster count to just 10(!) players. Technically, teams aren’t allowed to drop below 11 players (not including two-way contracts), but the Raps likely received a short window to rectify that issue due to the nature of the trade deadline. They’ll add an 11th man when they sign Malcolm Miller to a 10-day contract, which will likely become official tomorrow. They’ll have two weeks to add three more players to their roster to get back up to 14 players. The Jazz didn’t make any moves this week and continue to carry a full 15-man roster. 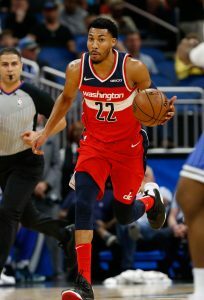 The Wizards had 13 players on standard contracts and John Jenkins on a 10-day contract before making a pair of deadline trades. They used their open roster spot to take on Bobby Portis and Jabari Parker for Otto Porter, then made a 1-for-1 deal involving Markieff Morris and Wesley Johnson. Washington now has a full 15-man roster, but can open up a spot when Jenkins’ 10-day deal expires tomorrow night. It looks like the Sixers are probably not signing anybody. But if they do, why would they waive Korkmaz — who is part of the rotation, if at the back end — over Amir Johnson who was replaced by Bolden in the rotation BEFORE Amir got injured, and now is even further back in the rotation with the acquisition of Boban plus better options at PF than pre-deadline? Korkmaz’s role has been pretty modest lately (8.1 MPG and 3 DNPs over the last 13 games) and may be further reduced with Ennis and Simmons entering the picture. He also expressed frustration earlier in the year when he wasn’t playing much, and will be a UFA in a few months. Johnson could be a release candidate too, and I think Patton is way more likely to be cut than Korkmaz, but it’s not as if Korkmaz will be a crucial piece down the stretch. Since the Cavs waived Simmons before his second 10-day deal expired, are they allowed to potentially re-sign him to another 10-day deal or would they have to sign him to a rest of season contract? Would have to be rest of season. Even though the Cavs didn’t let it finish, Simmons got paid for two full 10-day contracts, so he can’t get a third from them.